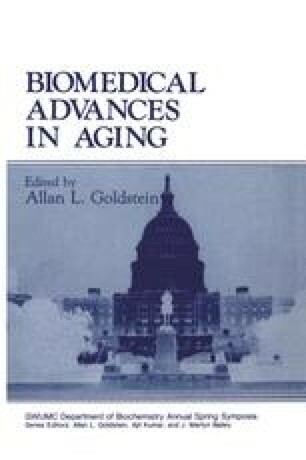 Investigations into mechanisms by which macrophages distinguish mature from senescent calf cells showed that a glycoprotein, senescent cell antigen, a terminal differentiation antigen, appears on the surface of senescent cells (Kay, 1974, 1975, 1978, 1981a–c, 1982a; Bennett and Kay, 1981; Kay and Bennett, 1982; Kay et al., 1982). It is recognized by the antigen-binding Fab region (Kay, 1978) of a specific immunoglobulin G (IgG) autoantibody in serum that attaches to cells carrying senescent cell antigen and initiates their removal by marcophages (Kay, 1975, 1978). Senescent cell antigen was first observed on the surface of senescent human erythrocytes (Kay, 1974, 1975) but has since been demonstrated on the surface of lymphocytes, polymorphonuclear leukocytes, platelets, embryonic kidney cells, and adult liver cells (Kay, 1981a).